An interesting dark black Obsidian with a silver sheen – small inclusions cause a gorgeous shining silver effect. 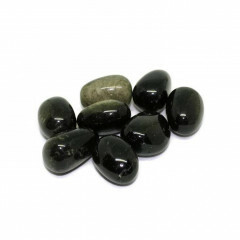 A gorgeous type of black Obsidian with small inclusions that cause a silver coloured shimmering effect on the stones surface. It measures around 5 on the mohs scale, and is generally sold either tumble polished, or carved into decorative shapes like eggs or spheres. 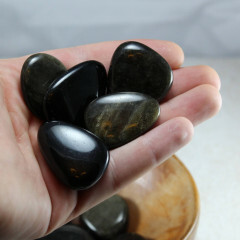 It may also be known as ‘silver Obsidian’, ‘lunar Obsidian’ or ‘sheen Obsidian’. It is associated with the base Chakra and the Third Eye Chakra. It is said to be useful at working through negativity, and helping to ground oneself, as well as aiding with patience. It is thought to be related to the moon – whereas Golden Sheen Obsidian is thought to be related to the Sun.